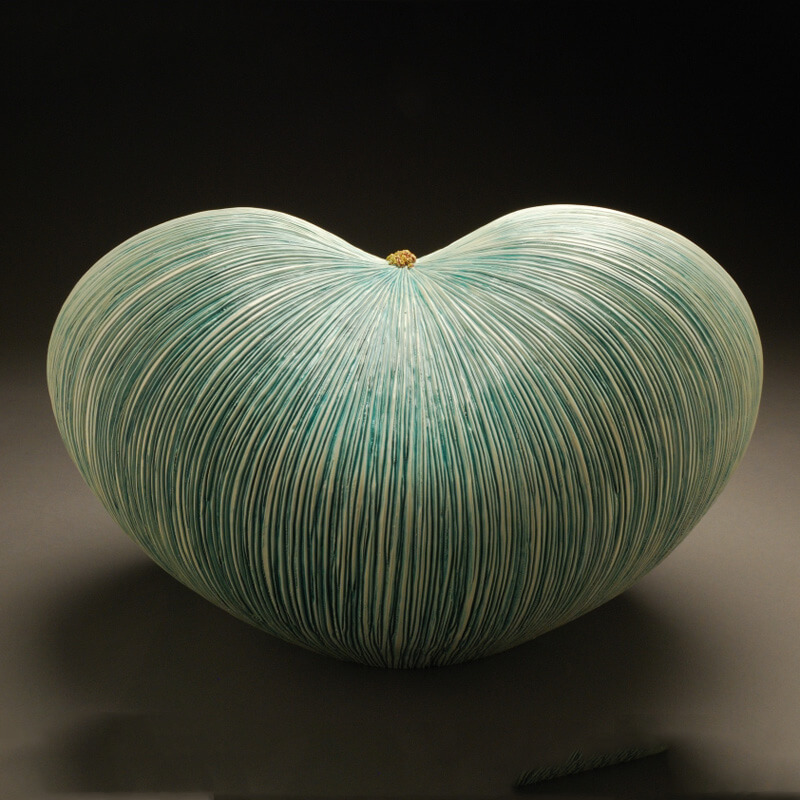 Angela Cunningham is a ceramic sculptor working at Mudflat Studios in Somerville MA. She received her BA in Philosophy from the College of William and Mary in 1999 and her MFA from Penn State in 2004. She exhibits internationally and has received many arts fellowships, notably the Brother Thomas Award, Niche Award, and several Massachusetts Cultural Council grants. When she’s not making art, you will likely find her hiking, reading, eating good food, or at a concert! I make objects that beg to be touched. Through sensuous surfaces, intricate details, and provocative imagery, I strive to draw viewers near to explore. As much as I want to seduce, though, I equally want to push people away – to awe with the beauty of an object and perhaps repulse with the details. The imagery in my pieces is drawn largely from nature. I am inspired by the seductive textures, elegant lines, and fertile energy of flowers. Fruits and vegetables fascinate me with their tantalizing colors, dense seed structure, and grotesque beauty. The human body enters here and there – the curve of a hip, the softness of belly. Most often my pieces are an amalgamation of natural forms. The variety of imagery allows for psychological shifts in response to the pieces – at one point the piece looks like a flock of birds, the next like a sea creature, the next like an overgrown fungus. With each shift from one image to the next comes a different emotional response. At one point it appears beautiful, the next grotesque; at first inviting, then perhaps intimidating. More and more, my obsessive process feeds the content of my work. I have given myself over to investment. Every part is sensitively considered, well-loved; details are rendered with an attentiveness that borders on obsession. I strive to capture a sense of exquisiteness in its richest definition.